First off, apologies all around, because Nymphaea caerula, the blue lotus, one of the three species present in the Nile, contains " [an] aporphine having activity as a non-selective dopamine agonist," and it is a controlled substance in the Baltic states. That being said, some people get high by chewing an entire sheet of Zantac, and I kind of doubt that the Early Iron Age had a blue-lotus-related public health emergency going on. It most certainly did have a problem with people who were tempted to take off into the marshes and get away from it all. And put offerings on the fire For Sobek, Lord of the Lake"
The collapse of complex societies used to be big! With drama! Cities left to ruin; economies transformed, technologies changed. None of this dragging-out "secular stagnation" thing for the Ancients, no sir! Lay yourself down a nice "destruction/dark earth" layer, and go off and live in the mountains or the swamp or wherever. With some exceptions: Egypt made it through the Late Bronze Age Collapse and the Fall of the Roman Empire well enough. It looks as though the country was uniquely suited to complex society (no need to spell out why, I suppose). It didn't go entirely unscathed, however. Egyptologists divide the Ancient Egyptian past into three periods of high monarchy, and three "Intermediate Periods," although, as the maths of group theory will suggest, one of those Intermediate periods can't have been Intermediate. (The trick is that we don't count the Persian-Ptolemaic-Roman interlude as an Egyptian monarchy; so the Third Intermediate can also be the last period --unless we throw in a brief phase of Egyptian revival in the Classical Period, as we can if we want, for we are licensed historians. What made Egypt special, in comparison with, say Roman Britain? My conclusions probably aren't worth the electrons they're written on, but the evidence I rely on is building up, and really ought to be accounted for in a good theory. So, just to review, the traditional view is that the Late Bronze Age Collapse was probably caused by some proto-Vikings who rampaged around the Mediterranean and came to grief upon Egypt's shores. Tired of the effort of defeating the Vikings, the Egyptians then promptly fell into a "Libyan anarchy." The fall of the Roman Empire is vaguely dated to practically every period when there was a Roman Empire, but around here we at least try to keep our eyes on the Atlantic shore, and explore what happened in Roman Britain, specifically. Here, attention has to focus on the late Third Century, when the British did their best to Brexit the Roman Empire, and were dragged back into it by Constantius. Is there a connection? I mean, besides the Vikings, who so easily achieve a meta-historical status and show up as Saxons, Franks, actual Vikings, and, yes, Sea Peoples, in every historical era when a mightily-thewed barbarian from the sea is wanted? I think so. Almost fifty years ago, in a slim, self-published book, the eccentric and marginalised Egyptologist, Alessandra Nibbi, proposed that the Sea Peoples were an invention. Marsh-living people who had escaped the drudgeries of farming the land to live as herders and hunters, they represented the human side of the primordial chaos of the inundation season over which Pharaoh's monarchy triumphed. Far from being from remote islands on the far side of the Mediterranean, where their traces had been sought in Sardinia, Sicily and the Dodecanese, the "Sea Peoples" lived in the "sea of green" that was the untamed Delta; the reason that they allied themselves with "Asiatics" and "Libyans" was that these peoples were shifting pastoralists who moved in and out of the Delta seeking forage. Last week's reading was eye-opening in that another, more recent scholar, has documented this process, during a specifically Egyptian crisis lasting from 158 to 171, using the tax archives of the Mendesian nome, assisted by some other texts. But, first, the post-Sea Peoples "Third Intermediate Period." Wikipedia has a nice map, so I stole it. 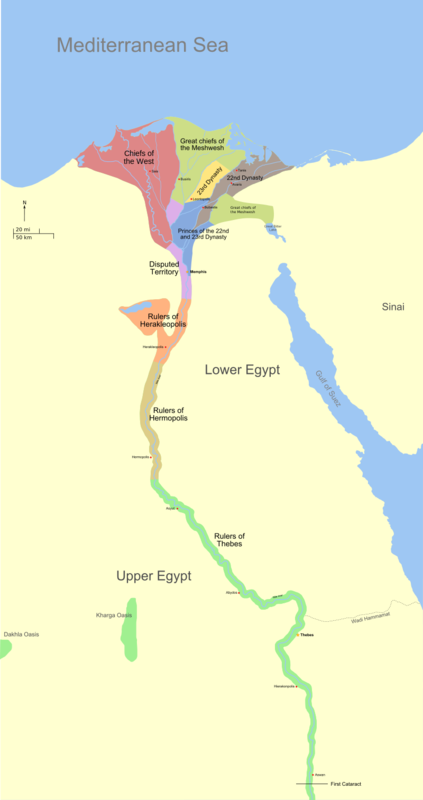 It has to be rather big, unfortunately, because ancient Egypt was a fabulously svelte country, but it's still a great map. (A Google search confirms that everyone else has, too.) You can see that Egypt has broken up along the Nile. The "Rulers of Thebes," who are probably, at least to begin with, the line of the hereditary Priests of Amun, control the bend of the Nile with its eastward extension to the Red Sea and westward extension to the oases of the Western Desert and the caravan road that stretches through them into the depths of Africa; a veritable turnstile road to the wealth of an entire continent, with access limited by forage. 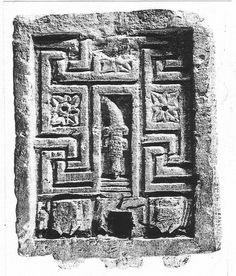 The ruler of Thebes also controls the most important necropoli of old Egypt, including the ur-cemetery of Abydos and the Valley of the Dead. Last time I was on about this, I talked about the Ramesses XI's Age of the Whm Mswt, or "Renaissance," from which we have extraordinary surviving texts documenting court processes against high-ranking officials implicated in tomb robbing. It would be hard to believe that their survival was accidental, even were it not for the extraordinary caches of royal mummies in KV35, and, even more tellingly, High Priest Pinedjem II's tomb in the Theban necropolis. Whatever other sources of power the rulers of Thebes might have drawn upon, they were clearly digging up the bullion and other treasures buried with the Pharaohs of the New Kingdom. Downstream, we have the rulers of Hermopolis, about which I can say nothing of any value; the rulers of Herakleapolis, which extends into the Fayum. Look, I say, again: the geography of Egypt is more complicated than we understand. This enormous oxbow lake exists, too! Its era is old by now --in what is no doubt far too schematic a theory, I like to imagine the Egyptian state slowly growing downstream as it begins with the easily controlled, narrow valleys upstream during the Old Kingdom, then inserts its hydraulic state into the Fayum during the Middle Kingdom; before, finally, beginning to take on the Delta under the New Kingdom. Which brings me to the delta, divided, as it is between "chiefs" and dynasts. The reason I like this map is that it seems to confirm the "indigenous Sea Peoples" model by showing how the Delta de-Egyptianises when state control is relieved. Before I did into Brouin a bit more (and, looking at the clock, I doubt that I'm going to have time to do her justice), I want to drag Roman Britain into it. Thanks to metal detectors, the last few decades have been a golden age of Roman hoard discovery in England. We now have a count of 340 Iron Age hoards and 2700 Roman hoards in England; of which 600 of the latter were deposited in the second half of the Third Century, by far the highest rate of depositing unrecovered hoards in all of British history, and also the highest for the Roman Empire. These are not minor deposits, either. By an eyeball estimate, hoards with a "late Third Century provenance," including one dated, with laser precision, to 271*, contain 150,000 coins; three huge hoards of the early 4th Century add up to another 90,000. Bearing in mind that records are pretty spotty before the Nineteenth Century, it seems that we can apply a multiplier pretty freely here. When the Roman Coin Hoard Project completes its work, it may be in strking distance of a pretty radical conclusion: Basically, every coin in Roman Britain was hidden, some time after 271. If David Potter is right, we understand why. Roman price levels had been constant over three centuries, except in Egypt, where there was a great surge at the end of the Second Century (that is, during or just after Brouin's crisis years of 158--171). At the same time, the silver content of the silver coin had slipped to 2%, while the gold content of the gold coin, but not its size, had held firm (which is weird, but not as weird as the fact that the Roman economy was officially on the copper standard). there's a pretty straightforward explanation. Then, it seems in 274, Aurelian issued a new gold coin of very high purity, allowed the value of gold to float, and issued a new, 5% silver coin at an official 20:1 copper-silver valuation. Egyptian prices series show an immediate eight-fold price increase. Potter thinks that Aurelian's motivations were purely political, that he just wanted to signify a new era in Roman history with a new coinage, but the upshot would probably have been a surge in hoarding. Whether the reform was pushed through with enough resolve to account for basically all the coins in England going into hiding, is another matter. The contrast here, between Egypt and Roman Britain cannot possibly be more stark. Egypt, facing the decline of the state, launches the most dramatic de-hoarding effort in history, one still remembered today as the great Tomb-Robbing of Egypt. Roman Britain's somewhat dubious treasures are still being found at the rate of 80 a year. What's the difference? This is a libation table, recovered in the ruins of Mendes. The idea is simple: wine, perhaps grown in vinyards in the marginal, dry land, is poured onto the table, where it "inundates" a symbolic geometry of the Two Lands. Egypt's agricultural economy is all about the inundation. Seasonally-inundated land is normal: privately held, it is understood to be planted in "grain," and is subject to a standard tax in kind. Every nome authority had a nileometer, and the readings of the meter determined the quality of the inundation and the exact scale of that year's taxation. The system did not prevent Anachoresis, the absence of taxpayers from their residence, when excessive tax levies led them to flee to --wherever, but it did guide the local authorities in issuing tax remittances. In the 23rd year of Antoninus Pius (159), the kommogramateus of the Mendesian nome suspended tax collections entirely in "several" villages, justifying the decision in a report to the Prefect of Egypt on the grounds that the village of Psenerienpsis was completely deserted, while the others had only two men, "who had fled." Prefect Annius Syriacus responded by lifting the Ptolemaic system of collective responsibility for tax arrears with a new system, in which the remaining landowners were re-assessed the entire tax liability of the administrative division. The upshot was that the two remaining men would only owe their personal tax payments --but these might be reassessed to be considerably more than previously. Perhaps not surprisingly, they remained "fled." Not all land in the Delta was seasonally inundated. Much was nearly permanently flooded. This was deemed public land, and leased to users, who paid in the form of taxes in cash. In 166, it was noted that 26 of the registered 31 leasing fishermen in the village of Zmoumis in the Phernouphites toparchy were missing; some had fled, some had died of natural causes, others had been attacked and killed by "Nichochites," the group that, as we saw last week, Brouin equates with the Boukoloi, cattle-herding primitive rebels/bandits of the period, and which I am unsubtly equating to the Sea Peoples. Fragmentary assessments from 166, 167 and 168 list more depopulated villages. Two other villages, these one of farmers, may have been attacked by Nichochites. In 169, the village of Nemeo, formerly of 150 men, and an assessment of 10 artabai of wheat, had been reduced to 45 men, of whom 34, "ruined," had "fled." Desertions continued until 172, when Prefect Caius Calvisius Statianus lifted all tax moratoria. So what happened? The Egyptians were understandably obsessed with drought and dry years, although none are recorded in this period. At the same time, "dry" is also a category of land. Whereas artificially inundated land is counted as half-inundated, dry land is, like permanently flooded land, public land, and subject to leases. In the case of dry arable (including vinyards), however, the leases are distributed by something that Brouin enigmatically refers to as a "forced auction." Presumably, large landholders/taxpayers were entered into a Lottery-like process to ensure that useful, but low value land did not go to waste. Brouin suggests that the ongoing silting-up of the Mendesian branch, a recorded low flood in 156, and suspected lows in 157, 166 and 168 might have precipitated the crisis by rendering "dry" and artificially-inundated land unproductive. It gets a little more complicated, though, because the early "Nichochite" outrages are directed at fishing and cattle-raising activities --involve the humid parts of the nome, in other words. In Brouin's reconstruction, "ruined" farmers --ruined, perhaps, because of losses on ploughing the "dry" public lands-- fled to the marshes of the "Nichochites," and joined in their outrages --which were, understandably enough, directed at the successful bidders for the wetland leases. Large landowners with tax remittances burning a hole in their pocket are well positioned to bid up the wetland leases, and the nome authorities stand to take their share. Certainly the results look like an outbreak of leveling violence. At this point, and with all due respect to the hard work of the nomarchs and the tax assessors, one has to wonder just what is the cause of all of this incipient inequality, in which men are ruined by the burden of farming the dry --or, perhaps, just paying their taxes-- while outside authorities assess the situation as one in which the last remaining farmers in a given village ought to be paying vastly more taxes? This looks a great deal more like a situation in which a failure to levy taxes at the correct level is leading to social unrest than it does one in which extrinsic factors, whether climactic, disease-related, or hydrographic, are impoverishing the population. Caius Calvisius Statianus has the right of it. Given enough troops (and money to pay them), and a willingness to levy taxes at the assessed rate, and the nome will come back into order quickly enough. So does the analogy hold? Are the vast hoards of Late Third Century Britain a massive tax strike, and first signs of a dramatic rise in economic inequality that will be manifested in the villa culture of the next century? Something is going on here. *The hoard, found at the site of the former Hyderabad and Meeanee Barracks in Colchester, Exeter, contained 1,247 coins, issued by nine Roman Emperors between Gallienus and the breakaway Gallic Empire ruler, Victorinus. The latter's ephemeral reign makes it very likely that the coins were deposited in 271.